The companion book to the series -- A Science Odyssey: 100 Years of Discovery by Charles Flowers -- will be available in hardcover from William Morrow and Company, Inc. With a foreword by Charles Osgood and an introduction by Charles Kuralt, the book is an exciting introduction to science and the history of ideas, colorfully and accessibly exploring the wonders of technology, astronomy, earth sciences, physics, biochemistry, medicine, human behavior and paleoanthropology. Filled with the stories, personalities, and astonishing discoveries that continually redefine scientific frontiers, the companion book is an essential guide to what we know, what it means to our lives, and what we are likely to learn next. 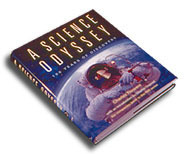 A Science Odyssey : 100 Years of Discovery will be published in January 1998, to coincide with the broadcast premiere of the series. Excerpt from Chapter One, "Mysteries of the Universe"